​Why Sal’s Auto Acton Towing? Our customers tell us that they keep coming back because they know they can trust us to provide the best towing and auto maintenance & repair service at the best value. 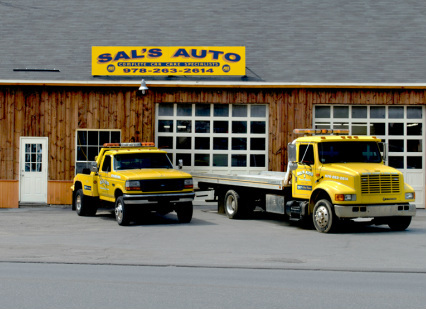 The Sal’s Auto & Truck Repair team not only tows and fixes your vehicles, we educate you on ways to keep your car running smoothly, efficiently (to save gas) and safely. Quality, honesty and ethics underscore everything we do. Sal's technicians expertly service all vehicle makes and model - cars, SUVs and light trucks! We guarantee all our workmanship for life. The majority of our parts have a 12 month / 12,000 miles (whichever comes first) warranty on them. We use only top of the line quality or factory parts on all electrical computer components. We strive for 100% customer satisfaction. All Sal's auto mechanics are ASE (Auto Service Excellence) trained using state-of-the-art computer diagnostic equipment.